My Orange Brompton: New Brompton Toolkit Tyre Levers - Are they any good?? 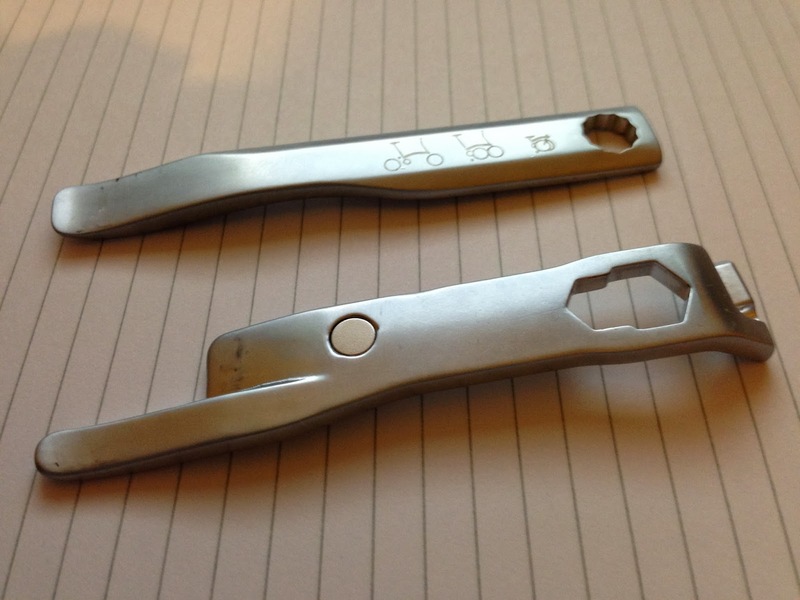 New Brompton Toolkit Tyre Levers - Are they any good?? Many of you out there will know that the tyre levers in the first Brompton Toolkit had to be recalled and were updated for the new Toolkit released in time for Christmas. Until yesterday I had not used these new tyre levers and having now used them to take off a 'Marathon Plus' no less, I thought I'd give my opinion of them. The Marathon Plus is a particularly tough tyre and it is equally as tough to take off. Despite being quite adept at performing this task (thanks to Mick B) these tyres are not easy. My Original Orange Brompton got rather dirty on the excellent Docklands by Dark (Please click) ride on Friday and my wheels and tyres were so filthy I had to take them off to give them a good clean. Using the Brompton Toolkit to undo the bolts was effortless but it was the levers that surprised me. Following the instructions on the rather nice packaging the tyres were off - front and back - in next to no time. It was certainly faster than I have ever done this task. Putting them back on was as easy. The new levers are quite brilliant! I had been using heavy duty plastic ones but these make life much easier. I now have some confidence that should I need to replace an inner tube at 03:00 a.m. on a dark country lane, I have the right tool for the job! So, are they any good? Yes!!! Click on the link below for a review of the Brompton Toolkit. The Nikon AW1 - All the camera you'd ever need?! I get stopped by the Police!